During their formation over millennia, healing crystals harness the life giving elements of the universe. Imbued with the energy of the Sun, the Moon, the earth and the sea, these gems and stones are an important connection to the planet we live on. The short answer is yes. But, I'm guessing you aren't here for the short answer. Humans are logical creatures and, as such, we need to have meaningful experiences with things on an individual level to fully believe and understand them. The seemingly complex nature of crystals makes it difficult for many people to see or feel the energy of crystals. With an open heart and mind, you can enter this mysterious journey of healing yourself with crystals. When you focus your energy on something, it expands. Thought and intention are like a roadmap for energy to follow. Crystals amplify, transform, harness and guide energy. Wait, what does that mean? Read on if you want to know more about your personal power and how you can use crystals to enhance it. Tired of reading? Here's a video! Much of how I understand the use of crystals and why they work is based on the Seven Principle of Magic, first published in The Kybalion in 1908 and purportedly based upon ancient Hermeticism. The Kybalion itself claims to have influenced all major religions and philosophies ancient and modern alike. 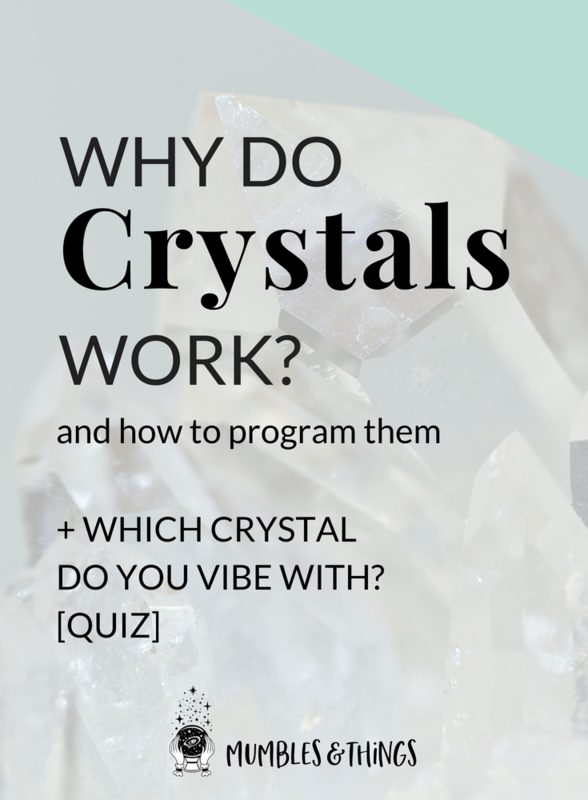 Let's look a little deeper into how you can use crystal to manifest your intention. Your thoughts create your reality. You are a reflection of your surroundings and they are a reflection of you, therefore your mind is the most powerful tool you possess for directing your life down the path of your choosing. If you focus your thoughts and energy only on the things you want to see happen in your life and you will see these things flourish and grow. Thoughts supplied with energy become reality. The flow of energy follows the intention of your thoughts. Learn to monitor and control your thoughts and intentions. Hold them in your mind and in your heart. Focusing your thoughts on an outcome and projecting your thoughts into a physical object—like a crystal—can help turn that thought into a reality. This takes plenty of practice and dedication, but eventually it will come naturally, just like breathing or blinking. Everything—whether it's physical, energetic or spiritual—vibrates at some level. Your emotions and thoughts can be communicated by the level they vibrate at. Crystals act like antennae by growing and amplifying your vibrational energy. These vibration fields can be impacted by the unique energy of each crystal you hold within this field. This is why it is important to have control over your thoughts: the crystal will immediately go to work acting on your thoughts and projecting this energy further than your own human energy could. Practice spending more time in positive emotional states. Clear Quartz has been on Earth since it formed from bits of stardust. Today, it makes up 12% of the Earth’s crust and is used in almost every kind of technology, including electronics, time keeping, information storage, and more. It’s possible for crystals to communicate through computer chips, so isn’t it possible that this vibrational energy is transformed in other ways? And with their connection to the Earth and all its life giving elements, it makes sense that crystals are universally healing, especially since they’ve been used as protective talismans, peace offerings, and jewelry in almost every civilization before us. Related: Why do Humans Love Crystals? The work done by IBM scientist Marcel Vogel provides one of the first pieces of scientific evidence relating to the power of crystals is. While watching crystals grow under a microscope, Marcel noticed that his thoughts changed the shape they formed. He also tested the metaphysical power of quartz crystal and proved that rocks can store thoughts similar to how tapes use magnetic energy to record sound. Albert Einstein said everything in life is vibration, and just like sound waves, your thoughts create the vibrations of everything that manifests in your life. At every moment, you have the ability to choose your thoughts and as you continue your journey, each day presents you with new challenges and wonderful beginnings. Crystals remind you to quiet the chatter of the mind and reconnect to the universal vibrations. Patience is an important lesson to learn from crystals. It took eons of time to evolve and transform each crystal or stone, and manifesting you goals—whether they relate to your health, your relationships, your finances or anything else—also takes time. Use crystals as a gentle reminder of gratitude for the abundance of Mother Earth and the great mysteries of the universe. HOW Do I Program My Crystal? Good question! I can tell you're one smart cookie. Programming a crystal to work for your intention is as easy as holding something. If your hands can hold things you can do this. Many ancient civilizations used crystals for a variety of reasons, so their is a wealth of knowledge and experience that has been handed down for generations. the newest one in your collection. one that you have been thinking about a lot lately. the crystal that attracts you based on appearance. one that simply has “good vibes” when you touch it. The other resources available on this blog may also be useful for choosing crystals based on your challenge or needs. There are no rules when it comes to choosing crystals. Whenever you purchase or receive a new crystal, I recommend setting the intention for this crystal to work for its highest potential. I call this pre-programming. This step basically prepares the crystal to accept your intention and cleanses it of any prior intentions or negative energy. To do this, see the crystal as surrounded in a bright, white light that fills it with positive, loving energy. You only need to see this light in your mind. Be sure your thoughts and intentions are focused on positivity and love. There are many methods of cleansing crystals (or pre-programming them). Feel free to try out others to see what works best for your purposes. You may find that for healing, a crystal pre-programmed in the moonlight works better than one you cleansed in water. At this point you have chosen a crystal and set it up for success. Now, focus your thoughts on an intention. What is an intention? An intention is a clear statement of purpose in regards to your aspirations, dreams and values. It can help you to live mindfully and presently. Decide what matters to you. What you want out of life? To succeed in achieving you goals in life, you need to recognize what drive you. What areas of your life do you wish to upgrade? Your career, your relationships, your health, your community? It can be helpful to write down your intention as this brings your intention into the physical realm. Write it in present tense as if it is already happening. Be specific about what you want to achieve, when you want to achieve it and why. This is when you give the crystal a job to do, assign it with a purpose. Once the crystal has it's assignment it can help realign you with your goals every time you encounter it. To program the crystal is simple. You need to start by raising your personal vibration. Close your eyes and take several deep breaths. Find the place where your vibrational level is highest—your bliss. You can find this by focusing on your connection to you faith or spiritual belief, or something that makes you incredibly happy like your children or a special loved one. Allow this love and light to fill you completely. Pick up the crystal you have chosen and cleansed. Hold it in your hands. Remind yourself of your intention. You may read it allowed or in your head from the sheet your wrote it down on. Feel the energy of your thoughts flow through you as you read. Feel it pulse in and out of the crystal with your heart beat. The more energy you put into the intention, the more effective it will be. Spend as much time as you want with your intention and your crystal. You might want to finish programming by saying thank you. This emphasized that what you are asking for already exists in the universe. When you have finished programming this crystal with your intention you can work with it in other ways. It can be a gentle reminder of your intention every time you see or touch it. Keep in mind, it isn’t necessary to fully understand exactly how crystals work to experience their effects. If you are still struggling with whether or not they are working for you, rest assured that they are. Whether you understand it or not, they are working hard to heal you with their wonderful energy. 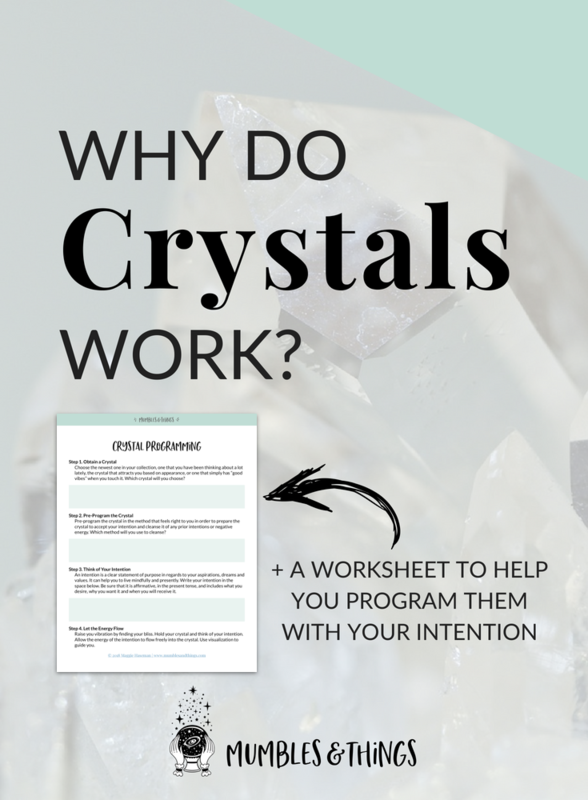 The worksheet below is designed to help you keep track of the steps involved with programming your crystals. Use it until you get the hang out things. To download the .pdf file click the button, enter your information, and click the link in the thank you message. It'll open in a new window where you can download it to your computer or print it out. Continue growing with and learning about your crystals and share your experiences on the Mumbles & Thing Community Facebook Group. Follow my crystal board on Pinterest! Have you used crystals to enhance your intentions? Tell me below in the comments.